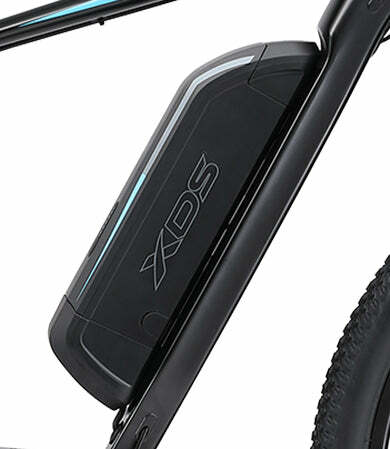 A great electric bike needs a great battery to work. 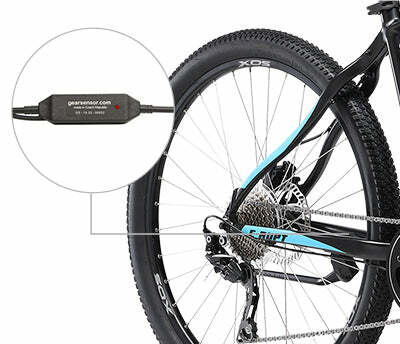 The E-RUPT comes with a big 36v 2900mAh Panasonic cell to keep you going and going. 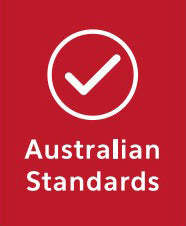 Safety tested to strict international standards and comes with intelligent protection board for longevity and durability. 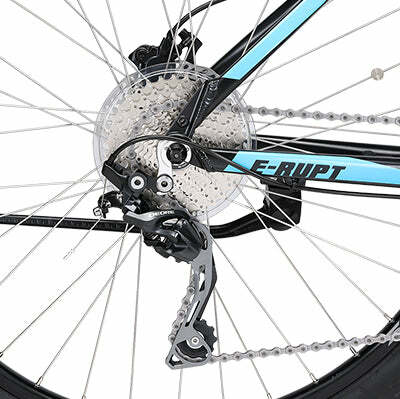 When shifting gears, riders should reduce torque through the drivetrain for a smoother transition. 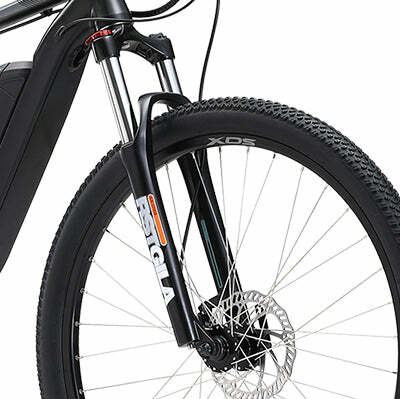 Typically, electric bikes emit torque five times higher than riders are capable of producing on their own, so regularly shifting gears at high speeds can be damaging to your drivetrain. 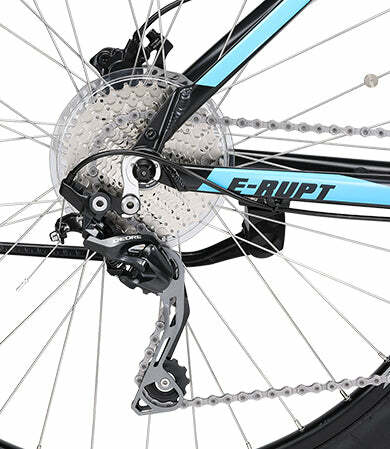 The Gear Sensor briefly cuts out the motor when changing gears to provide a more secure shift and prolong the life of your drivetrain. 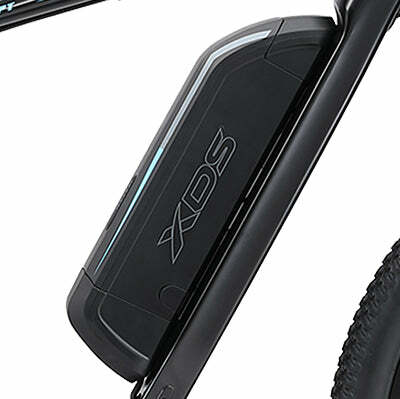 Experience a revolution in lightweight and durable alloy with the unique XDS engineered X6 Ultralight Aluminium Alloy Frame. 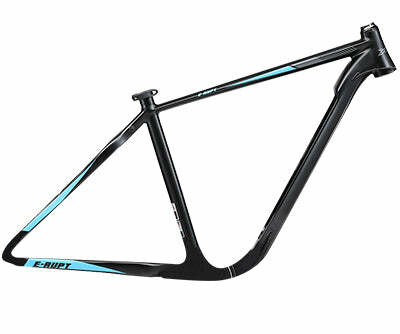 The X6 is a top-tier hydroformed alloy frame using the composition of the stiffest aluminium alloy to bring you the lightest, highest quality and top-tier reliability. Co-developed with Central South University Aluminium Alloy Research Institute for engineering excellence. Find consistency in pedalling through any incline and uncertain terrain, on road and off, with the Shimano Deore 10 Speed Drivetrain. 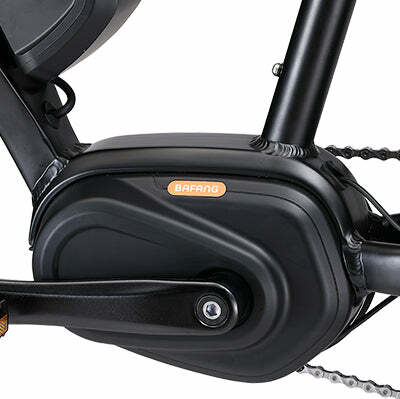 Shimano Rapid Fire Plus shifters make cycling through gears quick and simple. 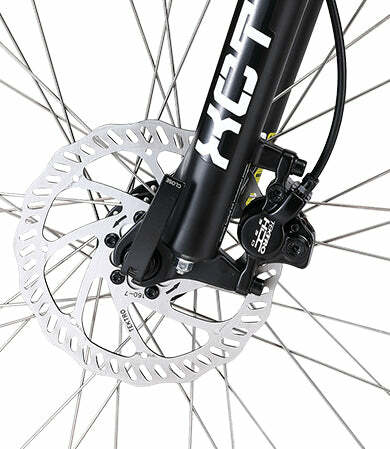 Suntour XCT suspension forks absorb blows from uneven surfaces, keeping yourself and your frame comfortable. 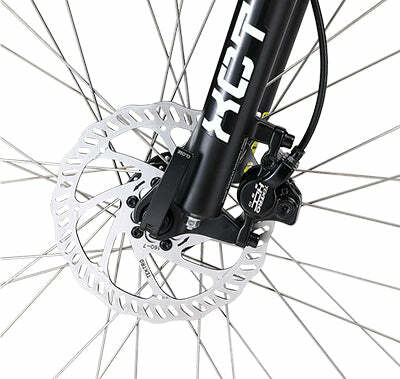 Suntour XCT also lets you adjust the travel of your suspension to tailor fit your ride. 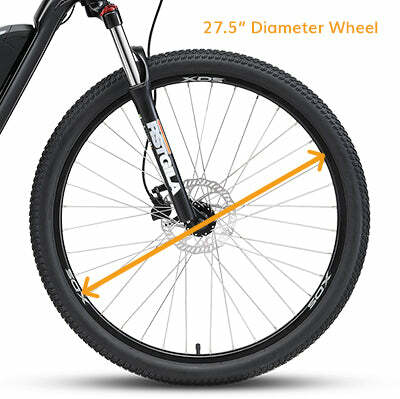 The 27.5” wheel size fits between the standard 26” mountain bike wheel, and the larger 29”. 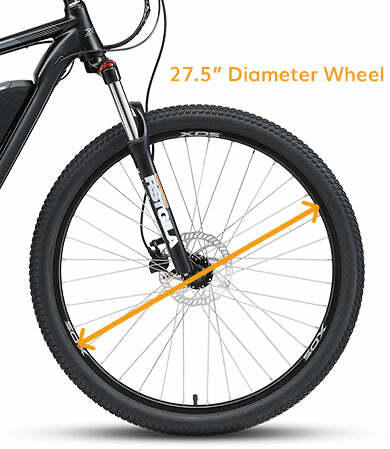 As the middle option, the 27.5” benefits from the advantages of the 26” and 29” bikes. 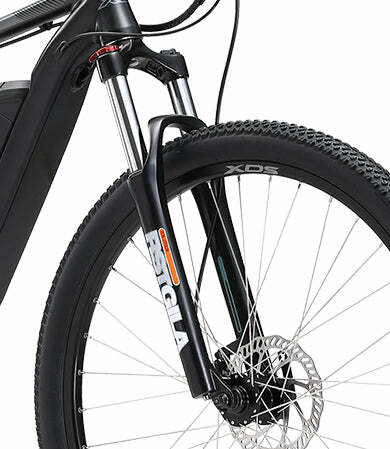 A 27.5” bike is more stable over bumpy roads than the 26”, and easier to control in jerky, quick changing terrain than 29” wheels. 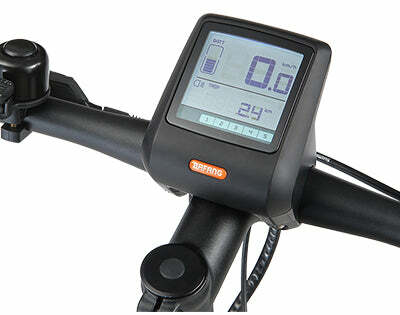 Motor Bafang Max-01, 36V/250W, Limit 25km/h, CL: 49mm, with Controller and Battery Communication, AU. 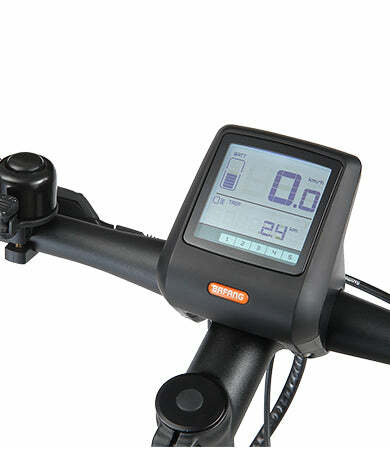 Display Bafang LCD Display, DC 36V, 0-5 Modes, UART Communication, with Walk Boost and Light Switch. Battery Phylion, CB5A0181 36V/11Ah, 2200mAh cell, with Intelligent Protection Board and Communication.